Lunch is cooked on the premises and we provide a varied menu. School meals are £2.10 per day and payment of dinner money should be strictly in advance and via the School Money system. Parents can, if they wish pay half-termly. If your child is absent, a ‘credit’ will be carried forward. Further details of our School Dinner Money Policy are available here. If children wish to bring a packed lunch we ask parents to support the school’s policy on healthy eating as we have achieved the National Healthy Schools Award. It is our policy not to allow children to bring sweets to school but to encourage them to choose a healthier alternative, e.g. fruit, nuts, cheese etc. 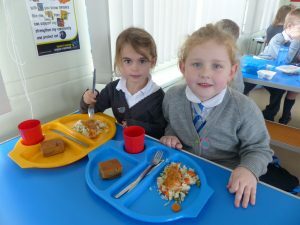 School dinners are £2.10 per day for children in Nursery and Years 3,4,5 and 6. If you think you may be eligible for Free School Meals please REGISTER. Children from families in receipt of Income Support are eligible for free school meals. You apply for this online at https://www.stockport.gov.uk/start/free-school-meals-application-form or enquire at any of the Authority’s Information Offices. This does not mean you have to take up a hot meal option every day but it does mean the school receives additional funding which we only receive if families have registered. We are registered for the Cool Milk scheme in school. All under 5’s and those on Free School Meals are entitled to free milk in school. All our nursery children are offered milk on a daily basis. However, older children in school need to register with Cool Milk at http://www.coolmilk.com. To promote healthy lifestyles all children are encouraged to drink water through the day. School provides individual water bottles for all children, and they learn about the benefits of water consumption to aid concentration and learning.